Tickets for this race go on sale in a little over a week. I’m not going to lie, I got a little misty going over all the info… I can’t wait to finish this! I never thought training to run a half marathon would be so difficult. I mean, I honestly thought that if I just kept running, and slowly increasing my mileage that I’d be golden come February. But as I dive deeper into training plans and lament over pace issues I can only WISH my first thoughts about running were true. And once I’ve gone through all this training and hard work, and finishing the Princess Half LIKE A BOSS… then what? Do I go through the rest of my running life perpetually training? Will I learn to love running just because? My last pair are almost a year old. *gasp* I know, right? How can I call myself a runner? 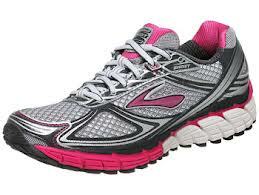 They’re still the Brooks Ghost 5 (because I loved the first pair so) but this time they’re PINK! Perfect for this princess! He tried to begin c25k, but couldn’t quite get through the second jog. I’m alarmed at how far he has to go, but I know he can do it if he sticks with it. Isn’t that how anything works? If I can create and give birth to a whole human being in 9 months, training for a half marathon should be a piece of cake. Right?? Choices loom before me… Running groups? Training plans? Diet changes? I hate feeling restricted. Do I just listen to my body and run longer when I’m feeling strong, take it easy on days I don’t feel it? In my panic to prepare, am I over thinking it all? I’m thinking I should just be able to lace up my shoes and run… but that seems to be the hardest part.